Soil and irrigation water salinity is one of the most important problems limiting crop yields and particularly in Mediterranean climates. In these semi-arid climates salinity can be a stressful factor which fluctuates during the year, especially within the current context of climate volatility. 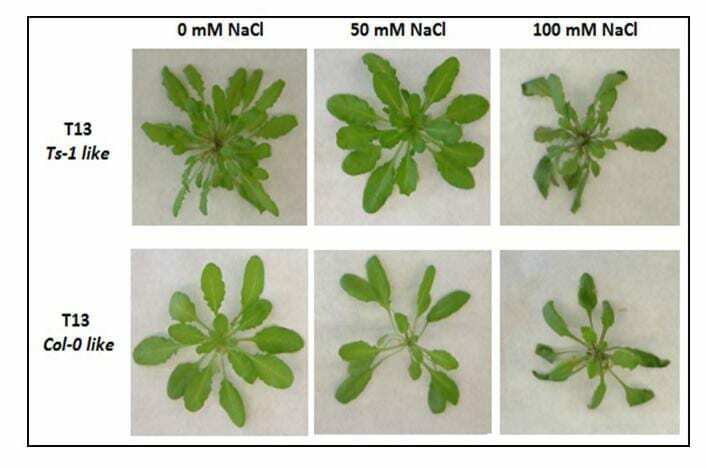 Researchers from the Unit of Plant Physiology at the UAB Department of Animal Biology, Plant Biology and Ecology, in collaboration with the University of Nottingham and the John Innes Centre in Norwich, recently identified several modifications in a sodium transporter gene called HKT1;1 with key relevance to the adaptation of natural populations of the model plant Arabidopsis thaliana (A. thaliana) to environments with fluctuating soil salinity. In the study published in the prestigious journal Proceedings of the National Academy of Science USA researchers conducted a large-scale genomic analysis of the 77 A. thaliana individuals found in natural populations of different salinity gradients located between Blanes and Cap de Creus. The integration of this data with the 1135 A. thaliana genomes belonging to the global collection has led them to verify that Catalonia’s varieties showing a high level of adaptation to moderate and fluctuating salinity levels are not Iberian relict plant species, but rather are part of a fairly recent colonisation and posterior adaptation. The adaptation mechanism of plants confined to soils in which salinity levels vary substantially depending on rainfall is based on structural variations of the HKT1;1 gene which produces changes in the level of expression of this protein. Plants with a low expression of HKT1;1 at root level present high levels of salt in leaves (plants HKT1;1HLS). At first this may seem harmful, but to a certain extent the accumulated sodium in the vacuoles can improve osmotic adjustment and prevent the salt from reaching reproductive tissues. Nevertheless, when salinity levels are too high, as on the seafront, they become toxic for these plants and thus need to use a mechanism of exclusion. When HKT1;1 expresses itself normally (plants HKT1;1LLS), sodium cannot enter the plant through its roots, thus favouring the transport of potassium instead and allowing the plants to survive in these conditions. Using new and innovative sequencing techniques (10X Genomics Chromium platform) scientists were able to detail all genetic variations present in the different forms of ‘HKT1;1 identified in this study. These results are not only an example of how molecular functions can be revealed based on natural variation data and through the demographic dynamics of populations, but also of how highly valuable information can be obtained to help improve the sustainability of crop yields in a scenario of increasing salinity due to human pressure and climate change. The study’s lead author, Sílvia Busoms, conducted her PhD thesis under an international co-tutorship by the UAB and the University of Aberdeen and with doctoral supervisors Charlotte Poschenrieder (Unit of Plant Physiology, Department of Animal Biology, Plant Biology and Ecology, UAB) and David Salt from the University of Nottingham. Part of the results published come from this thesis, which recently received an extraordinary prize from the UAB PhD programme in Plant Biology and Biotechnology. The rest are the result of Sílvia Busoms’ postdoctoral stay at the John Innes Centre in Norwich at the Laboratory of Dr Levi Yant.